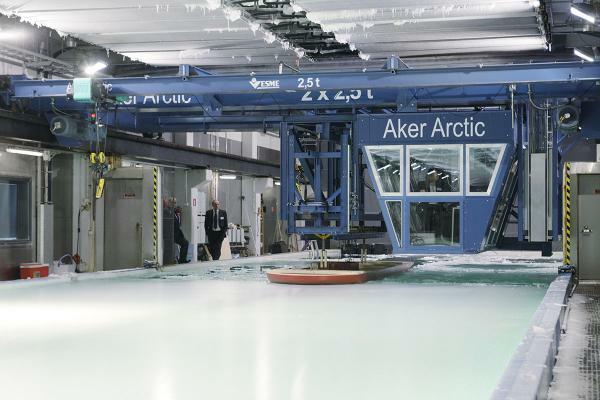 Aker Arctic is a private company specializing in development, design, engineering, consulting and testing services for ice-going vessels, icebreakers, offshore marine structures, marine transport solutions and ports. Our experienced, highly qualified and innovative personnel are able to provide our customers with specialized arctic know-how, as well as innovative, cost-effective and reliable designs for the projects in Arctic and other challenging conditions. The company operates a special test facility in Helsinki. This combined with our extensive experience and the world’s largest reference for icebreakers means we are uniquely placed to bring the benefits of our solutions to our customers. We are always actively seeking new technologies and working with our partners to turn them into successes. Aker Arctic’s story is rooted in the history of Finnish icebreaker construction since the late 1930s. Until the 1970s, icebreakers were developed and built based on experience with previous vessels, combined with full-scale experimental tests. The first ice model basin was set up in 1969 to assist the oil company Esso International Inc in its 1969 Prudhoe Bay development project to allow oil transportation services through the Northwest Passage. Its first task was to develop the icebreaking hull form for the converted crude oil tanker SS Manhattan, which performed successfully in the ice fields north of Alaska. The ice model basin continued to operate under the name Wärtsilä Ice Model Basin, part of Wärtsilä Shipbuilding. In those years, the Helsinki yard was continuously building icebreakers and other ice-going tonnage. A specific design and consulting department, Wärtsilä Arctic Design and Marketing, was established in the early 1980s, working together with Wärtsilä Ice Model Basin. In addition to in-house R&D, it offered research and consultancy services, ranging from ice model tests to full-scale field trials with ships and structures, including ice data collection expeditions. The name Wärtsilä Arctic Research Centre (WARC) was adopted in the 1980s. In the mid-1980s, the Arctic Technology group took over, this shipyard organization also being in charge of marketing ice-going ships. The second laboratory was inaugurated in 1983. The scientific work became top priority, resulting in several important developments. MARC FG (fine grain) model ice was developed, and even patented. When the land lease agreement expired, the decision was made to build a new, bigger, ice model basin. Agreement was reached with the city of Helsinki in late 2004 to build the new facilities in the Vuosaari area, east of the centre of Helsinki, alongside the Port of Vuosaari. In 2005 Aker Arctic Technology Inc was founded as an independent company. Moved to the new premises and simultaneously expanded its operations by ship development and design. We work together to create success for our customers, and strive for continuity in our cooperative relations. We take a constructive view of the opinions, ideas, and views of others. We participate in open discussions, and share information with each other, and we trust each other. Everyone takes responsibility for their own actions, and helps colleagues when needed. We dare to venture into new areas, taking on new challenges. We seek the best possible solutions for everything we do. We are not afraid to give our opinions and views, or to tackle problems while at the same time giving space for development. We are the best in our field, and strive for continual improvement. World-class workmanship and quality come through in all we do. We are always developing new technologies, and work to maintain our staff’s expertise and training. We have the experience and know-how needed to work to our full potential. We apply the state-of-the-art technology, using only the best equipment. We tell it like it is, and we can be counted on. We do not hide the fundamental things in our work, and are open to communication. We always take responsibility for the end result, and can be proud of it. Aker Arctic’s Quality Management System has been approved by DNV GL to conform to the ISO 9001:2015 standard for design of icegoing ships and structures, feasibility studies, research and development, contracting, product sales, consultancy on ice related issues and testing of icegoing ships and structures. The current certificate is valid until 28 February 2021. We do not have any open position right now. Open applications with CV can be sent to info@akerarctic.fi at all times.